With your wedding round the corner, you are desperate to lose weight. Like always, the problem always is that you get the push to start losing weight. You start exercising, dieting and are completely dedicated with your weight loss endeavor. You in fact start losing weight as your body loses its water content and is surprised and jolted into reality with the changes in diet and exercise. However unfortunately this determination lasts only for say a week or two, or at the most a month and you find yourself slowly waning back to where you had started, to weigh more than you actually were! There’s always ‘some reason’ to make you stop your weight loss cycle. It could be the season, a cold, something wrong with kids or a weekend hang out with friends. The problem here is that everyone faces such obstacles in life in everything you do. This doesn’t mean that you should let it block your focus. You need to learn to overcome the obstacle and move ahead to continue whatever you had started. And to do this, you may need some motivation to lose weight. You need to see a reason to continue, and this reason should be something strong which your conscious can’t bring you out of. This reason is simple; you just need to start thinking and behaving like a slim person not only till your wedding but long term. This is because living and thinking like a slim person is a way of life, and not a course or temporary lifestyle change. 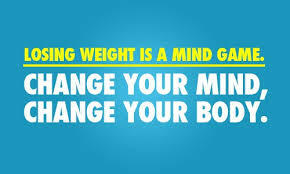 You will not be able to reach and sustain a healthy weight if you don’t change your thinking into a slim thinking. So the most important motivation to lose weight you need is to think slim. The most important thing to do here is to change your way of thinking while eating. Just think. What actually goes through your mind before you eat food? Do you keep tussling with yourself wondering if you should or should not eat it? Do you imagine how the food will taste or do you focus on the consequences after eating it? The obese usually imagine how the food will taste and feel as they eat their food. On the contrast, naturally slim people tend to imagine how heavy that piece of cake will feel in their stomachs long after they have eaten it. They calculate how many extra and unnecessary calories the cake carries and usually eventually abstain from eating it. So if you get tempted to eat something unnecessarily, the motivation to lose weight to follow is to think how your stomach will feel after ten minutes or half an hour of consuming that rich-calorie food. While you may find it a bit difficult to follow at first, as you develop the habit, you slowly develop a complete hatred towards sweets and all that junk food you always relished. It is this natural habit which you develop that provides the motivation to lose weight to become slim and trim in time for your wedding!